These are the remains of the old Chiricahua Apache Agency near Fort Bowie. 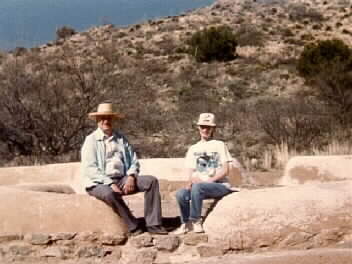 It is located very near the famous Apache Pass Spring (called Tú Sibáán [water,resting] in Apache). The agent of the Chiricahua Apache Reservation was the famous Thomas Jeffords, friend of Cochise. The reservation was set apart in 1871 but was terminated in 1876. John Clum, agent at San Carlos, removed what Chiricahuas Apaches he could from this spot to San Carlos, but he was able to move only about 350. All the rest of the Chiricahuas fled into the wilderness -- including Geronimo. My daughter and I are both sitting on the walls.